The Aquatics Team is responsible for the oversight and daily operations of the Kettering Recreation Complex indoor pool and the Adventure Reef Water Park. The Aquatics Team also supports a wide variety of aquatic programming such as swim lessons and water workout classes. Not currently American Red Cross certified? No problem! We conduct several in-house lifeguard trainings throughout the year. If you are interested in working for the Aquatics Team but are not currently certified as the position requires, be sure to check out our American Red Cross Aquatics programs or contact us at 937-296-2587 to see what certification courses are coming up. We are currently hiring seasonal and year-round positions, including Lifeguards, Swim Instructors, Water Park Attendants, Water Workout Instructors, Concession Attendants and Concessions Management. Check out the links below to see which opportunity could be right for you! This seasonal part-time position (up to 40 hours/week) assists with the overall operations of the Kettering Recreation Complex indoor pool, Spa Area and Adventure Reef Water Park during the summer season. Pool Managers must be enthusiastic, water-loving leaders who are ready to serve the aquatics needs of our community. Pay range: $9.35 - $11.45/hour. Entry rate is contingent upon candidate’s related skills, knowledge and abilities. Must be certified in lifeguarding, CPR/AED, First Aid and have at least 1-year of lifeguard experience. Lifeguarding positions are available for both seasonal part-time (up to 40 hours/week) and year-round part-time (up to 28 hours/week). 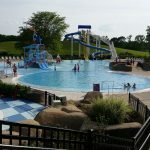 Lifeguards may work at the Kettering Recreation Complex indoor pool or the Adventure Reef Water Park and they are responsible for prevention of accidents and incidents in the water and the surrounding area. Pay range: $8.55 - $9.55/hour. Entry rate is contingent upon candidate’s related skills, knowledge and abilities. Candidate must be 15 years of age and hold current Lifeguard Training certification that includes CPR/AED and First Aid. Don’t have your certification yet? No problem! Give us a call at 937-296-2587 and ask about our Lifeguarding classes. Swim Instructor positions are available for both seasonal part-time (up to 40 hours/week) and year-round part-time (up to 28 hours/week). Swim instructors must be water-enthusiasts who love teaching participants of all ages to swim according to the American Red Cross program guidelines. Pay range: $8.55 - $9.95/hour. Entry rate is contingent upon candidate’s related skills, knowledge and abilities. Candidates be 15 years of age must hold current Water Safety Instructor Certification. Don’t have your certification yet? No problem! Give us a call at 937-296-2587 and ask about our Swim Instructor classes. 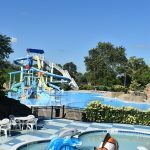 This year-round Contractual position is responsible for instructing 60-minute Water Workout exercise classes at the Kettering Recreation Complex indoor pool and the Adventure Reef Water Park. Pay rate is contingent upon candidate’s related skills, knowledge and abilities. 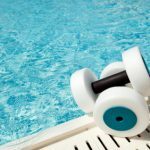 Previous experience as a water exercise or fitness instructor preferred. 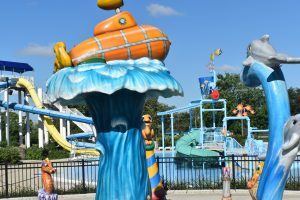 This seasonal part-time position (up to 40 hours/week) is responsible for providing a safe, clean and enjoyable atmosphere for the Adventure Reef Water Park attractions and water features. 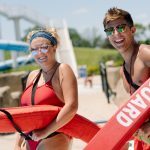 Waterpark attendants must be team players who are looking for an enjoyable summer job. Pay range: $8.55 - $9.25/hour. Entry rate is contingent upon candidate’s related skills, knowledge and abilities. Candidates must be at least 15 years of age. Cashier positions are available for both seasonal part-time (up to 40 hours/week) and year-round part-time (up to 28 hours/week). 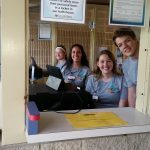 Seasonal cashiers may only work in the Adventure Reef Water Park, while year-round cashiers also work in the Kettering Ice Arena. Cashiers collect entry fees, dispense goods or services, and account for all fees during entry. Pay range: $8.55 - $9.25/ hour. Entry rate is contingent upon candidate’s related skills, knowledge and abilities. Candidates must be at least 16 years of age. This seasonal part-time position (up to 40 hours/week) is responsible for collecting fees, dispensing goods or services, and accounting for all fees at the Adventure Reef Waterpark Snack Bar. Pay range: $8.55 - $9.25/hour. Entry rate is contingent upon candidate’s related skills, knowledge and abilities. Candidates must be at least 16 years of age.